Although only a few routes exist here. 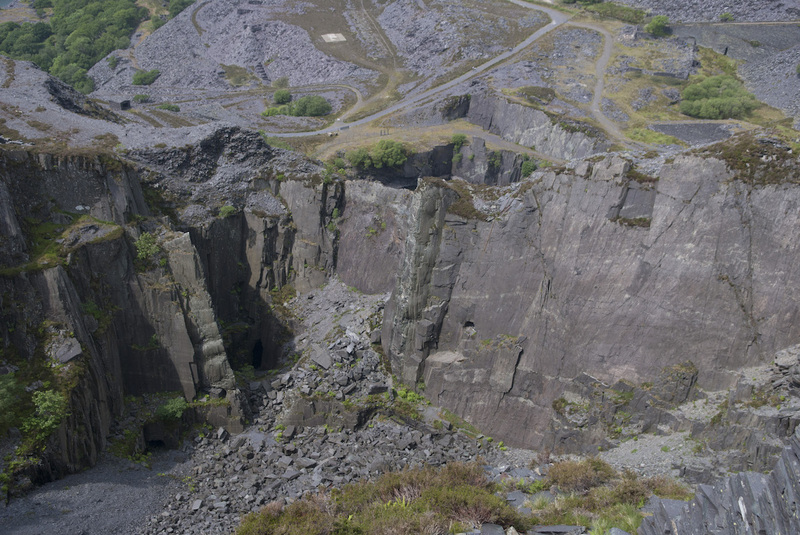 Those that there are are among some of the best in the slate quarries. The California Wall is one of the most amazing slabs of rock, whilst We Speak No Americano is a classic 6th grade sport route. All bolts have been replaced bolt for bolt, as close as possible to the existing placements. There were two bolt belays place over the top of the crag, one at the top of Waves of Inspiration, about 2metres back from the edge near a little gully. The second was on top of Central Sadness and is easily found by finding the slate shed. There is one bolt inside and one outside the hut. The following route recieve the treatment. All re-equipped 04/07. Simply Peach E5 6b. Peg replaced by a bolt. Start right of Central Saddness below a line of 7 bolts. Climb upto the little Groove heading straight up following the bolts. a couple of hard move past the last bolt leads to a ledge left of the detached spike on the 2nd pitch of CS. finish up Central Saddness. New route up obvious corner 10m left of California Arete. Pitch 1 climbs a blocky groove which leads up to the grassy ledge above. 4 Bolts + Bolt Belay. Pitch 2 make a tricky move to leave the ledge before continuing up the imposing line of weakness. Surmounting an awkward bulge provides and entertaining and unique crux. 7 bolts + Lower off. A good line, following the crackline about 10m to the right of `Tambourine Man`.Start below the obvious bolt, heading up to the righthand side of the halfway ledge,and a bolt, possible belay if someone wants to lead the easy pitch, then follow the crack all the way passing two more bolts and some wires. Tree belay. abb off `California Arete` chain. F.A. CHRIS DAVIES, MARK WILLIAMS, IAN LLOYD JONES. 05/06/2010.